LAToken (pronounced LAToken, not LA Token) is a blockchain based platform designed to allow its users to create/trade asset tokens. Cryptoholders are, thus, enabled to diversify their portfolio by accessing tokens linked to the price tags of real assets. On the other hand, LAToken allows asset owners to “unlock” the overall value of their assets by creating/selling asset tokens. As a result, the platform will introduce cryptocurrencies into the “real” economy. LAToken will enhance the transparency and liquidity of assets and reduce the overall transaction costs. The platform will allow the creation of third-party asset token listings, compliant with legal structure rules and LAToken disclosure, providing a transparent price discovery and diversification through multiple asset classes. Keep reading our dedicated LAToken review to learn everything about the platform and upcoming crowdsale. The official website also offers links to LinkedIn profiles of all team members, which greatly enhances user confidence in the validity of this project. LAToken platform has a lot of functionality, features, ideas, and value to offer. 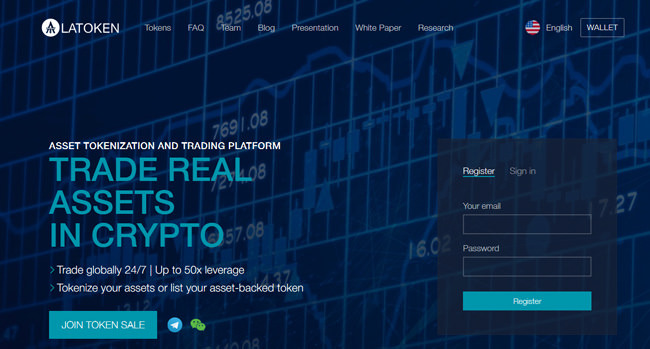 Exposure of cryptoholders to real asset prices -Cryptoholders will benefit from the platform by being “exposed” to the prices of numerous real assets, including debt, equity, gold, commodities, real estate, artwork, etc. Cryptoholders will be able to buy tokens linked to those prices on the LAT platform, with maximum transparency and security, as well as with low transaction costs. Disruptive reduction of transaction costs to unlock the asset value – LAToken will allow asset owners to unlock the value of their assets and receive instant liquidity by creating linked asset tokens and eventually selling them to cryptoholders. Eradication of data asymmetry and fraud – A significant market erosion has been caused by the issue of data asymmetry between asset owner and buyer. Under such conditions, low-quality assets have suddenly become more profitable to sell than those of higher quality. Reliable blockchain data provided by the LAT platform will be available to both parties before the transaction, with absolute certainty of its worthiness. LAToken is based on an existing and profitable business –Zalogo is a non-blockchain financial platform that precedes LAToken. Zalogo was also created by Valentin Preopbrazhenskiy and designed to provide private borrowers with bank loans, with their real estate assets used as collateral. LAToken is already an operational platform – The tokens can already be created and sold and their owners can then trade them on the secondary market. Tokens linked to the share prices (Amazon, Apple, Tesla…) are already being traded. LAT infrastructure already includes LAT marketplace, LAT wallet, back office, trading terminal, App store, and constructor. Wide options for diversification throughout major asset classes – The LAT platform solves numerous problems by offering better security for funds, seamless transactions, trading across different asset classes, and single compliance and disclosure standards for asset diversification. Strategic partnerships – LAToken is already partnered with Rivetz International, MyGold, and SlimVentures. Memberships – LAToken is a member of CryptoValley, a Swiss Government supported project. Additionally, LAToken will charge certain origination fees in fiats, including appraisal fees, insurances, trustee fees, and legal fees. The exact fees will depend on the smart contract details and the asset class. In order to keep users 100% secure, LAToken incorporates secure smart contracts and protection against DDoS attacks. It also uses security audit from a third party, escrow, and multi-factor authentication. The LAT token sale starts on August 22nd 2017, 14:00 UTC and ends on October 10th 2017, 18:00 UTC. The hard cap is set at 40 million dollars. The total number of LAT tokens to be sold is 180 million, according to the Whitepaper. The price of 1 LAT is 0.0014 ETH. Currently, there’s a pool of 400 million LAT distributed among the company, team, network investments, and sale, as well as 600 million frozen LAT, which will all be released over a period of 5 years. You can familiarize yourself with the platform even further by checking this LAToken YouTube review. The official LAToken YouTube channel will provide interesting insight into the “backstage” of the platform and offer certain explanations and estimates for the future. You should also watch this YouTube interview with Valentin Preobrazhenskiy (the founder of LAToken) if you’re interested in learning more about his thought process. LAToken Facebook and Twitter pages will also allow you to monitor the latest developments on the platform and see what other users have to say about the overall experience. You can also join the LAToken Telegram channel to be the first to learn about improvements and additions to the platform. LAToken brings an excellent idea to the table and we would definitely like to see this project succeed. As seen in our LAToken review, it’ll allow owners to tokenize the value of their assets and cryptoholders to expand the pool of assets that can be bought via cryptocurrency. The platform also features its proprietary wallet and marketplace in order to provide users with ultimate functionality. If you want to go wider with your LAT tokens, LAToken is expanding the list of available crypto exchanges as we speak. So, if you like the idea of, let’s say, buying a house or a painting for Bitcoin or Ethereum, we definitely recommend checking the LAToken project and taking part in its crowdsale.